In a city with thousands of restaurants, how can you easily find a last minute place to eat? Walk-Ins Welcome is a mobile app that provides real time data on restaurant openings and average wait times – ideal for restaurants that don’t take reservations or to fill last minute cancelations. The app collects openings data and connects interested diners to restaurants with availability. Role: UX Lead driving concept, user research, wire framing, prototypes and visual design. The On-the-Go foodie can use the app to find last minute restaurant options around them. The food curious tourist can explore popular New York restaurants without pre-arranged plans or reservations. We identified primary user screens based on user flows. 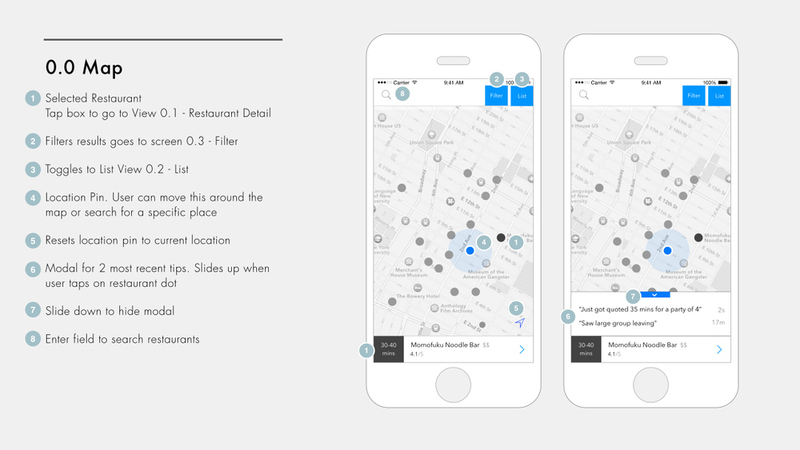 The information that distinguished this app from other similar ones like Yelp & Foursquare needed to be easily accessed through two main views: the map view and the list view. Additionally, I identified the benefit of integrating a crowd-sourcing element where users can post updates real time. Through Prototype testing, it was evident that additional filter fields could be beneficial to the user. 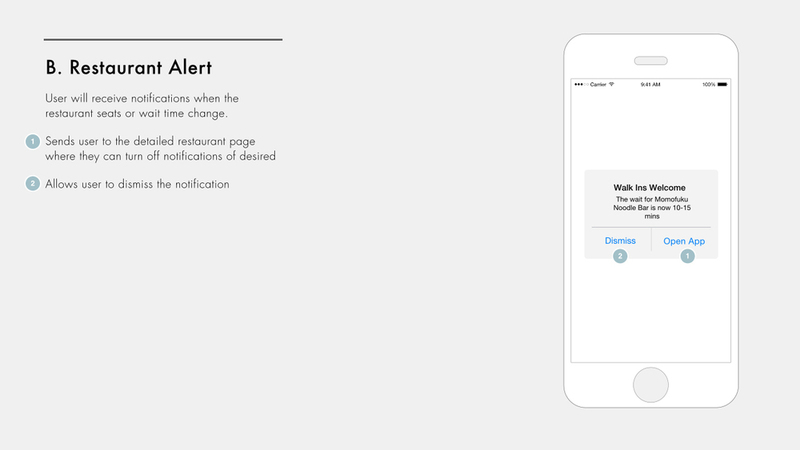 I also added an on-boarding experience through visual design that introduce the app to new users. Adopting a clean flat aesthetic would allow the user to focus on the information and functionality. Utilizing the two colors of red and blue help distinguish between seats available and wait times. Designing for the Apple Watch required a re-evaluation of the minimal viable product. Watch users tend to interact with their devices in spans of 2 minutes or less, so it was important to know what data provided by the watch app was the most useful to the user on the go. The watch app distills information down to the most vital features: restaurants and availability. Information accessed on the watch would be limited to 6 restaurants in the surrounding area.